Discover Sri Lanka's scenic landscapes and key wildlife attractions on this easy-paced, two-week walking holiday. Fly from the UK. Arrive Colombo and transfer to the Ranwelli Hotel at Waikkal. Take a short nature walk. Drive to Sirigiya with stops en route to visit a pineapple plantation and the famous Dambulla Cave Temples. The caves are a 15 minute steep walk from the road and are full of beautiful statues and carvings. Enjoy a thrilling elephant-back safari at Habarana National Park followed by an afternoon game drive at Minneriya National Park. The reservoir at Minneriya is a magnet for many birds but you may also see wild elephants, deer and monkeys. Early start to climb to the top of Sigiriya Rock and explore the remains of the ancient palace complex. In the afternoon, drive to Kandy and make an evening visit to the Temple of the Tooth. Take a scenic train ride from Nanu Oya rail station to Nuwara Eliya – in the heart of Sri Lanka’s tea growing country. Visit a tea factory and take a walk in the lush countryside. Early morning ascent of Adam’s Peak (2,243m/7,400ft) to watch the sun rise. Drive to Horton Plains area and spend the rest of the day resting after your early start. Enjoy a circular walk to see the main sights of Horton Plains including Baker’s Fall and the World’s End overlook. Drive to Uda Walawe via the scenic viewpoint at Ella Gap. Take an afternoon game drive in Uda Walawe National Park – one of Sri Lanka’s premier wildlife havens – then continue on to your hotel. 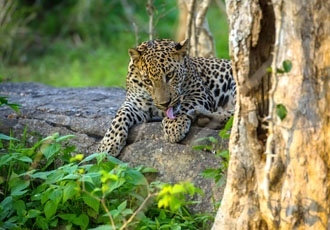 Today will be spent at Yala National Park considered one of the best places in the world to see leopards in their natural habitat. Return to your hotel. Drive to Hikkaduwa in the morning and check in to your hotel. Visit the old town at Galle in the afternoon and enjoy a walking tour around the atmospheric streets and ramparts. Whale watching from Dondra Head or Mirissa (November – April only) the premier place to see blue whales anywhere in the world. Drive to Colombo, transfer to your hotel and spend the day at leisure. Transfer to the airport and fly home. 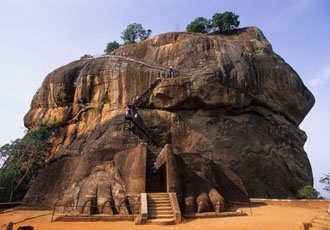 Ancient ruined cities, vibrant Buddhist temples, wildlife rich parks and idyllic golden beaches - just some of Sri Lanka's treasures to be discovered on this two-week cultural tour. Fly from the UK. Arrive at Colombo and take the short drive north to Waikkal. Transfer to Ranweli Hotel by passenger ferry. Take a guided nature walk into the mangrove swamps and a boat trip into the nearby lagoons – home to many species of birds. Relax by the pool or beach. Drive inland to Anauradhapura for an in-depth exploration of the ancient ruined city – now a World Heritage Site. Drive to Sigiriya via Kala Wewa Resevoir and the giant Aukuna Buddha statue. Full day tour of Polonnaruwa ruined city including the four carved Buddha statues. You can choose to explore the extensive site by bike or on foot. Early start to climb Sigiriya Rock and see the ruins of the ancient palace on the summit plateau. Drive to Kandy stopping at the Dambulla Cave Temples en route. Tour some of Kandy’s key sights such as the National Museum, the Tea Museum, Garrison Cemetery and the Temple of the Tooth. Visit the renowned Peradeniya Botanical Gardens and enjoy a Kandyan dance show. Take the train to Nanu Oya and drive on to the tea growing region of Nurawa Eliya in the highlands of Sri Lanka. Visit a tea factory to learn about the process of tea making. Afternoon stroll in the local countryside. Drive to Uda Walawe National Park and enjoy an afternoon game drive seeing wild elephants, exotic birds and other impressive wildlife. Drive to a resort on the Indian Ocean coast. Spend the rest of the day at leisure. Visit the old fortified town of Galle, walk around the weathered streets and the fortified walls. Drive to Mount Lavinia – a colonial-style hotel and one of Sri Lanka’s most famous. Transfer to Colombo airport and fly home.